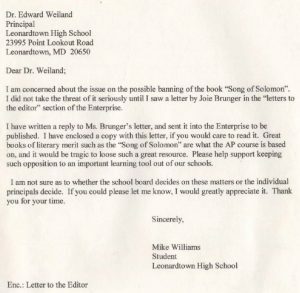 Mike Williams expresses his disappointment in someone accusing Song of Solomon of being not appropriate in an advanced placement classroom. At the time Mike wrote to the editor of The Enterprise he was a senior at Leonardtown High School. He read Song of Solomon in his junior year. He explains why students in AP classes can handle literature like Song of Solomon. He also reminds readers that the book is on the national approved reading list for AP English courses. Williams, Mike. “AP English Students Are Mature Enough to Handle Such a Book as “Song of Solomon”” The Enterprise, December 5, 1997. I was very disappointed to find a letter in your paper, (Nov.19) which accused the novel “Song of Solomon” of not being appropriate for Advanced Placement (AP) level classes. AP classes are taught as college courses, with a separate curriculum constructed to challenge the brightest students. These classes demand the highest level of dedication to the course work, and in return students are able to acquire college credit depending on their scores on a national AP test. I am currently a senior at Leonardtown High School, and have successfully completed two AP courses during my junior year and am enrolled in two more this current year. I read “Song of Solomon” during my junior year AP English course. I am concurrently enrolled in St. Mary’s College, and I have many times found my AP classes to be much more difficult than my college course work. Students cannot just decide to sing up for an AP class. They must show very good academic standing and have a teacher recommendation in that area of study. They usually will be required to pass a preliminary exam, and for many classes write an entrance essay. If a student is able to qualify for entrance into an AP course, he or she will not be treated as a high-schooler in that course. These students have shown that they are able to handle the rigors of such a course in a mature, adult-like manner. 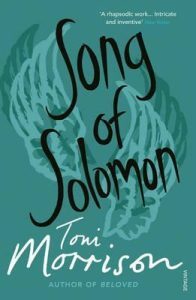 “Song of Solomon” is one of the many novels which contain material that AP students are expected to handle with maturity. All AP teachers which I have discussed this issue with agree that AP students should be able to read any novel of acclaimed literary merit, for AP students can evaluate these novels in an adult manner. If a student does not wish to face a novel such as this one, he or she should night sign up for the AP course. But if the student tries to ban that book, or in any way influence people which will eventually result in the banning of such a book, the whole AP class will suffer on the AP test. 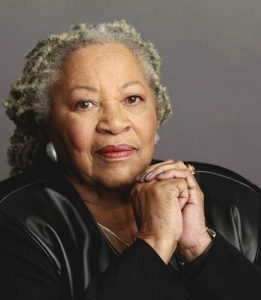 All AP English students who take the nationwide AP literature and composition tests are to have read certain novels which the AP board has approved. The AP board has approved “Song of Solomon” and AP students are held accountable for having read and interpreted the novel. If they have not read the novel and are not able to interpret it, it may considerably lower their test scores. The sexual practices and drug use described in the book become part of the book. They are not taught with any pretenses that would infer that the students should try this at home. They are presented as being neither positive nor negative, just part of the protagonist’s life. No parent should hide that these practices exist instead of education their child about them and warning of the dangers which come with these practices. 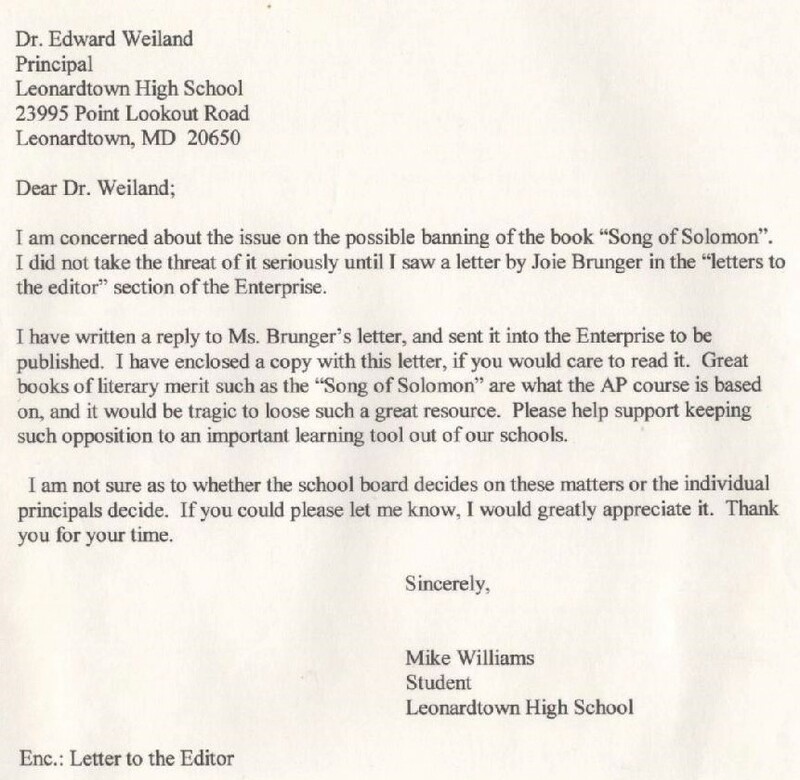 Mike Williams also wrote to the Principal of Leonardtown High School.